Although we went through a bit of a cool down this past week, we’re right back up to scorching temperatures again. Needless to say, it’s been one hot summer. Last year, there were only 5 days where temperatures soared to over 90 degrees. 5 days for the entire summer. This year, we’ve already at least 20 and we still have a little under a month of official summer left! The heat has trapped me inside, not allowing me to sit out and enjoy my patio even once this summer, because the second I step outside, I’m already sweating. And I hate sweating. So I cranked up the AC and broke out my ice cream maker to whip up something to help keep me cool—some delicious Peanut Butter Ice Cream. I’ve heard nothing but good things about David Lebovitz’s The Perfect Scoop. And I can see why. Looking through it, I have about half the book marked to try out. My poor little ice cream maker’s going to get a work out if this heat sticks around! And if I can ever remember to put the canister back in the freezer. I decided to try out the Peanut Butter Ice Cream recipe first, because it looked completely simple and almost idiot proof. Seriously. There are literally 3 steps to this ice cream. Blend. Chill. Churn. And freeze. Okay, technically 4 steps. But it’s still completely simple. No crazy ingredients. No custards to cook. 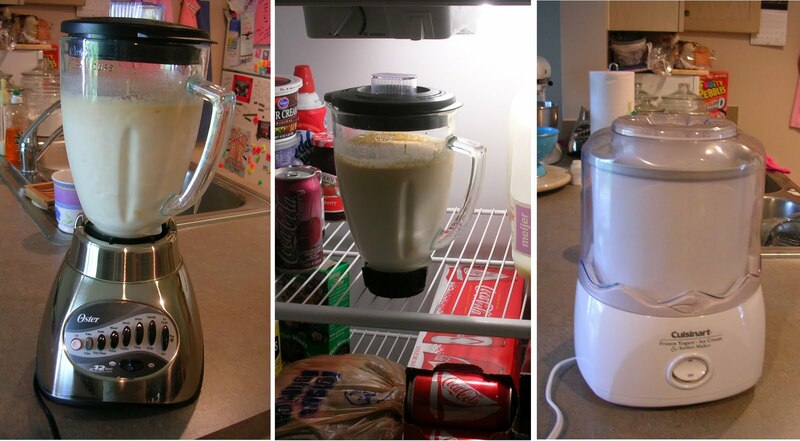 Throw it all in a blender, throw the blender jar in the fridge, pour the chilled mixture in the ice cream maker, and ta-da! Ice cream! And damn good ice cream at that. It wasn’t even done churning before I started eating it. That’s right. I’m not ashamed. I ate ice cream straight out of the ice cream maker. While it was running. It’s that good. Smooth, rich, and perfectly peanut buttery. If you’re a PB fan, you’re going to love this ice cream. I want to make batches and batches of it so I have a never ending supply to keep me cool. The only problem is where am I going to put it all? What have you done to beat the heat this summer? 1. Add peanut butter, sugar, half and half, salt, and vanilla to a blender or food processor and puree until smooth. 2. Chill the mixture thoroughly in refrigerator*, then freeze in an ice cream maker according to manufacturer’s instructions. *Note: The mixture might separate a little while in the fridge. Just stir it back up before you pour it into the ice cream maker, and it'll be fine. Dude, have you had Buckeye State from Jeni's yet? I am not normally a peanut butter ice cream fan, but that stuff is OUTRAGEOUS. Maybe because it's salty. Mmm, salt. I haven't yet! Now that my BF moved out of Grandview, we don't make it there nearly as often as I'd like (like every single day..) but I definitely want to try it! I love this book and every recipe I've tried so far is a keeper. Cold ice cream definitely beats walking out the front door into 90+ temps. Hot, I'm in the Sunshine State and in the winter we're in the high 80's and low 90's! this looks amazing! i can't wait for summer so i can make this. or then again, maybe i'll just make it anyway. yum!